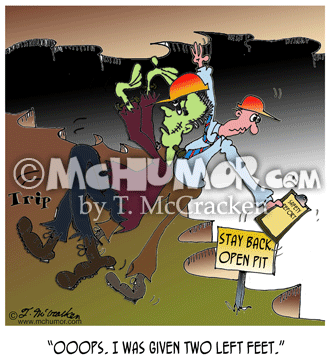 Safety Cartoon 7973: Frankenstein's monster tripping into a safety inspector knocking him into a quarry pit and saying, "Can I help it if I was given two left feet?" 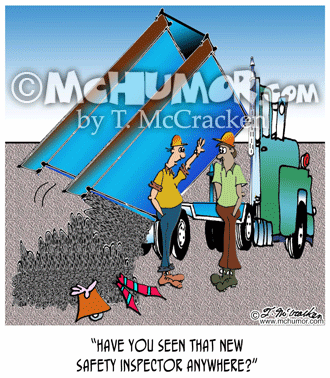 Construction Cartoon 8246: Because his back's turned a man doesn't see someone hanging onto a quarry's edge. He yells, "Hey, Bob, you coming to lunch, or what?" 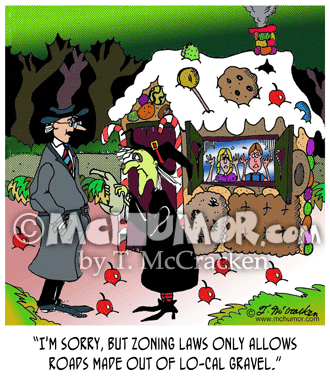 Construction Cartoon 8164: An inspector says to a wicked witch whose house is made out of cookies and road is made out of whipped cream, "I'm sorry, but zoning laws only allows roads made out of lo-cal gravel." 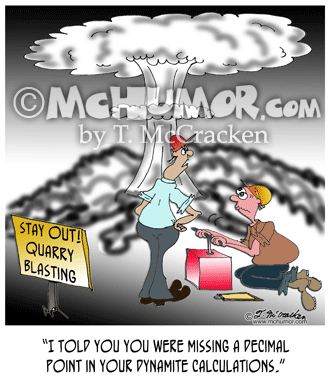 Explosion Cartoon 7971: Looking at a mushroom cloud in a quarry an explosive's technician says to another, "I told you you were missing a decimal point in you dynamite calculations." 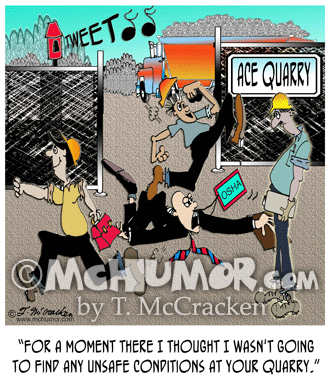 Quarry Cartoon 8152: When an OSHA inspector is run over by a mob workers running off when the stop work whistle blows he says to a foreman, "For a moment there I thought I wasn't going to find any unsafe conditions at your quarry." 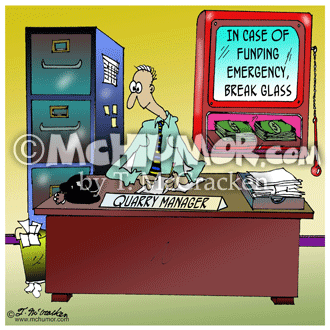 Quarry Cartoon 8332: In a quarry office, behind glass that says "In Case of Funding Emergency, Break Glass," is a huge wad of money. 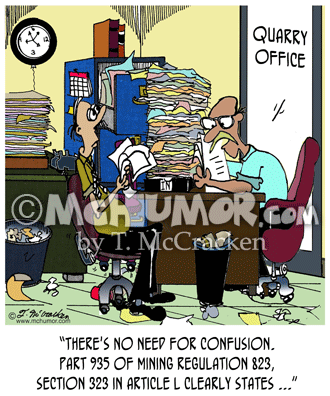 Quarry Cartoon 8331: A quarry manager leafing through a huge pile of papers says to another, "There's no need for confusion. 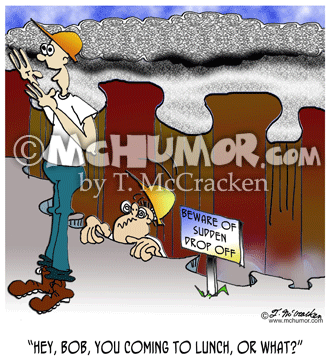 Part 935 of Mining Regulation 823, Section 323 in Article L clearly states . 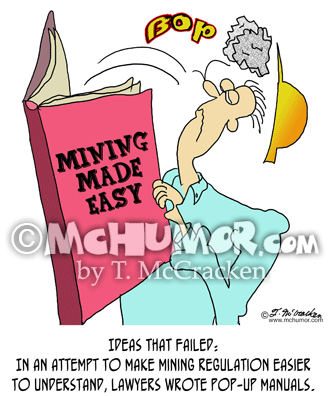 . . "
Mining Cartoon 8334: "Ideas that failed: In an attempt to make mining regulation easier to understand, lawyers wrote pop-up manuals." 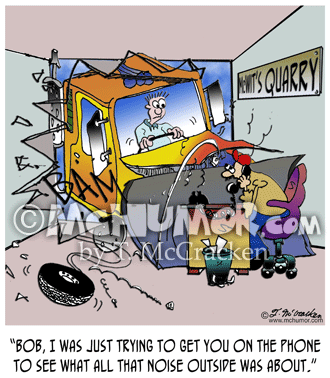 A man reading a book is knocked out when a rock is flung out of it.